On behalf of the Milton Girls Softball Association, I would like to thank all Coach applicants for their interest and time during this year’s selection process. I would like to congratulate the following coaches who have been awarded the Head Coach position for upcoming 2018/19 season in the corresponding divisions. Monday, September 3 @ 4:30 p.m. – 6:30 p.m.
Tuesday, September 4 @ 6:30 p.m. – 8:30 p.m.
Monday, September 3 @ 10:00 a.m. – 1:00 p.m.
Wednesday, September 5 @ 7:00 p.m. – 9:00 p.m.
Thursday, September 6 @ 7:00 p.m. – 9:00 p.m.
Friday, September 7 @ 7:00 p.m. – 9:00 p.m. 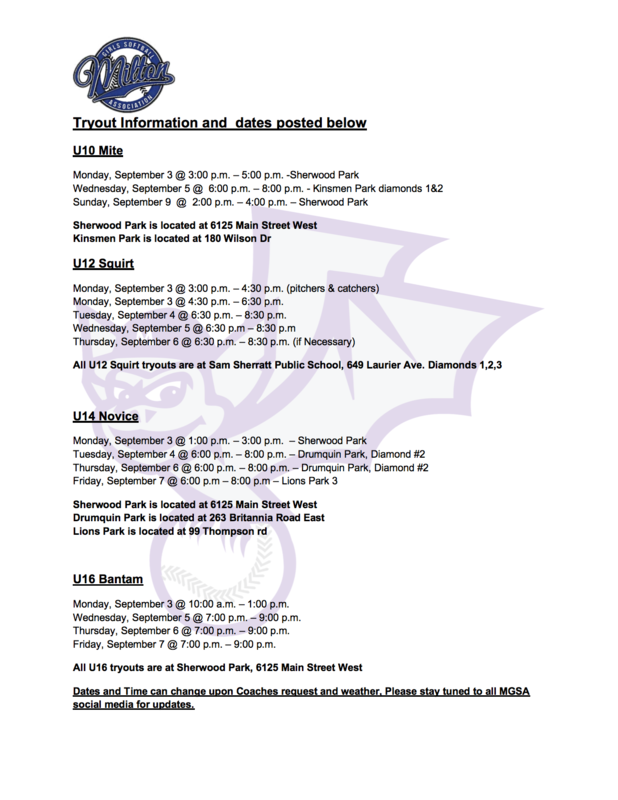 Dates and Time can change upon Coaches request and weather, Please stay tuned to all MGSA social media for updates.